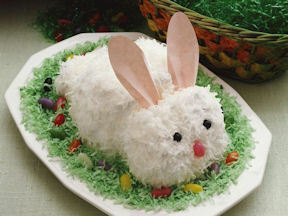 Kids Cooking 411: Let's Build an Easter Bunny Cake! Let's Build an Easter Bunny Cake! This cake has been a long time favorite for the Easter table centerpiece! Preheat the oven to the requirement on the box. Prepare the cake mix according to the package directions. Pour into 2 round 8-inch or 9-inch layer pans. Bake according to the package directions. Remove from oven and let cool for 10 minutes. Remove cake layers from pans and then allow to cool completely. While the cake layers are cooling either cover two pieces of cardboard with aluminum foil or find 2 flat plates to place the bunnies on. You can also go ahead and cut out the pink bunny ears from pink construction paper. Cut one layer in half. Put halves together with frosting. Stand cake upright on cut edge. Using a sharp knife (adult helper here, please)... cut a V-notch about 1/2 of the way up the semi-circle. Use the cake notched cut out pieces to attach with toothpicks for the tail. The area below the notch will will form bunny's head. The 2/3 area above the notch will shape the bunny's rounded back. Frost with remaining frosting from first can of frosting. Generously sprinkle with white coconut... the kids love this part! Use jelly beans for eyes and nose (the nose has to be pink :-)! Place the pink construction paper ears in the bunny's head. Place coconut in a jar with a drop or two of green food coloring and shake it up, baby! Voila... you've got grass to spread around the bunny! Add some jelly beans to look like eggs in the grass. This old recipe seems always to please. The kids will be so tickled with their Easter Bunny creation! Isn't it just the best, getting kids into the kitchen? May you and your family have a blessed Easter! New! Low-Carb Mexican: South of the Border Goes Low-Carb! 33+ Recipes Now Available on Kindle! A delightful tea with Teddy Bears! 101 Holiday Recipes to the Rescue! Now AVAILABLE on Kindle! I created the Kids Cooking 411 blog for fun and valuable information on cooking with kids, nutrition facts and the countless things that kids can learn from cooking. Cook with kids early as they learn about cooking with fresh and wholesome ingredients... it will stick with them for life! They're gonna love it! I'm a strong advocate in the fight against childhood obesity... stick with me and you'll learn how cooking with kids can have a huge impact on this all important issue... not tomorrow... not next week... RIGHT NOW! "Cooking is at once child's play and adult joy. And cooking done with care is an act of love." The 411 on Cooking with Kids! I'm so glad that you stopped by to check out the 411 on Cooking with Kids! Please stop by often as I'll be adding links to great recipes as well as other fun things to do in the kitchen with your kids or your grandchildren or any one else's children that you love to spend time with! Little ones are naturally curious and that's how they learn. Sometimes Mom doesn't have the patience or the time to let the little ones help in the kitchen. See if I can't help you change your mind on that... you'll find cooking with children extremely rewarding for all involved. Jan McCracken, Culinary Coach & "Adult Helper Chef"